Shakespeare’s plays continued to be performed in the early 18th century, but many of the texts were flawed. Garrick’s first major part was as Richard III, a role he played throughout his career. The text used had been cobbled together by Colley Cibber over a generation before. 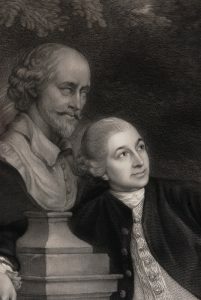 As manager at Drury Lane from 1747 to 1776, Garrick staged Hamlet, The Merchant of Venice, King Lear, Two Gentlemen of Verona, Cymbeline and Romeo and Juliet, all with altered texts. He also produced adapted versions of The Taming of the Shrew (Katherine and Petruchio) and The Winter’s Tale (Florizel and Perdita). These productions proved very popular and helped foster a growing critical interest in Shakespeare. Garrick’s friend Johnson published a scholarly edition of The Plays of William Shakespeare in 1765 and Garrick drew upon this, as well as the work of other editors, to produce a revised text of Hamlet in 1772, which was to cause a furore amongst later critics and theatre historians. Although this text brought back lines cut by earlier editions and restored many original readings, its drastic cutting of scenes and characters, notably the gravediggers, and addition of a new ending, tarnished Garrick’s reputation as ‘great Shakespeare’s Priest’ (William Cowper). One of Garrick’s most important contributions to the growing cult of Shakespeare was the idea of the Shakespeare Jubilee (see below). This was held in September 1769 to commemorate the 200th anniversary of the bard (actually 205th), on the banks of the Avon at Stratford. Although rained off, and subject to much ridicule in the contemporary press, the Jubilee inspired other such events across Europe and marked the beginnings of Shakespeare tourism in Stratford. Garrick planned a great ‘Jubilee’ in honour of Shakespeare on 6th and 7th September 1769 in Stratford-upon-Avon. It was months in the planning and articles in the press roused a mixture of interest and mirth at the idea. A great wooden amphitheatre (reminiscent of Shakespeare’s Globe) was built on the banks of the Avon. Music, sketches and odes were written in praise of Shakespeare, though oddly there were to be no productions of any of his plays. The highlight was to be on the second day, a procession through the town of characters from the plays, actors in the fine costumes from the Drury Lane theatre. September finally came; the actors and their costumes, the musicians and their instruments all assembled. So, too, did a great crowd of aristocrats, gentry and townspeople. The inns were full and food was dear. Those attending the Oratorio and Ball on the evening of the 6th paid one guinea each for a ticket. Then came the rain; it poured, the river rose and flooded the amphitheatre. The fireworks and horseracing were abandoned, as was the procession, as Garrick could not risk ruining the theatre’s costumes. It was a wash-out! However, Garrick recouped his considerable losses from the event by writing a humorous sketch about it, The Jubilee, including a pageant of characters. It was staged at Drury Lane on 16th October, although Colman had already put on his satire Jubilee at Covent Garden. Garrick’s version was very successful and ran for 90 consecutive performances. It was revived from time to time and Garrick had the text printed.